Pardon The Punctuation...South Beach is the kind of place that can overwhelm you. Loaded with tourists and overpriced crappy food, it's easy to get lost and frustrated. Rule number one: if the only way a restaurant can lure people in is by having some hot looking European or Brazilian hostess waving menus in peoples faces as they walk by..chances are you'll find better food in a Cambodian slum. With so many options in Miami I've taken the liberty of setting up a little itinerary to follow if you want to do it just right. Foodie style! First you need a place to rest your head. My vote is for the Surfcomber Hotel. Just close enough to the crazyness and just far enough away that you can get a goods night rest. Great comfortable rooms and probably the most attentive staff in the beach. The staff is so good you'd swear you're not in Miami. The free coffee in the morning doesn't hurt either. Breakfast: Panther Coffee's Miami Beach location is the way to go for coffee made with a little TLC in Miami. Also They've got killer locally sourced food also. Try a pour over coffee and then grab an almond croissant from True Loaf bakery just next door. Perfect breakfast. Lunch: Pizza Rustica is a South Beach staple and a must for any pizza lover visiting Miami. The orignal location on 9th and Washington ave is the best of the best for me. Check the four cheese and BBQ chicken slices if you want to cure an afternoon hunger. 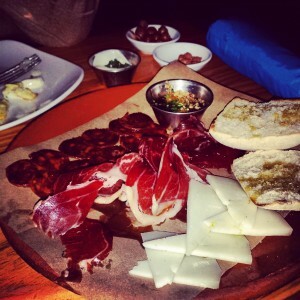 Dinner: Pubbelly is a relatively new place to Miami Beach. Only open for three years and with several restaurants under their belt, Pub Belly the flagship gastro pub of the brand. I'd hit up the pork belly dumplings and the short rib tartare. Some wonderfully presented flavors at this place. I need to give it another try. Sat at the bar and my server was so pretentious and douchy that it left a slightly bad taste in my mouth. I get that he was proud of the food they serve but he needs to realize that just because your restaurant is a big fish in little pond doesn't mean you're not a dime a dozen in New York, San Francisco, or Los Angeles. I'm not knocking the food at all. It was delicious..sometimes people just need know their place. I really hope that this guy is not a reflection of the chef. Dessert: For dessert make your way just around the corner from Pubbelly to IceBox Cafe. Great ambiance with some delicious cakes and pies. My top pics are the key lime pie and the deep dish apple pie. The key lime pie was refreshing with just the right amount of tartness and the deep dish apple pie tasted home made. Breakfast: Day two we're going with the latin theme. Star the day with some Cuban coffee and toast at David's Cafe. To do the authentic Cuban experience walk up to the outside window, order a cafe con leche with leche evaporada, a croqueta, and a tostada Cubana. Then to keep it real make sure to argue about politics as you eat standing outside. That's the true Miami Cuban way. Lunch: After catching some sun on the beach hit up Abuela's Kitchen for a huge portion of Vaca Frita. That's shredded flank steak that's pan fried with onions and garlic. This is by far my favorite Cuban dish. One you're done pound some Lipitor and take a nap. Dinner: Right around the corner from Pub Belly and from the same owners sits Barceloneta. What a great tapas place in Miami. They do it right. You must do the croquetas with jamon serrano and the patatas bravas. Remember these are tapas so don't get too full. After those two appetizers have a bottle of wine and enjoy it with some manchego cheese and paleta Iberica de bellota....trust me. Cocktails: For cocktails on your last night start at The Room. It's pretty much a dimly lit room with an eclectic list of beer and wine. The perfect place to star your night. After tipping back a few save the best for last. Hop in a cab up to the Delano hotel which is about a 30 second walk from the entrance of the Surfcomber. Walking in will transport you to the Miami that you've seen in movies. Sheik decor and probably the coolest infinity pool in Miami. Make your way to the back of the hotel and ask to have a cocktail on the pool. Literally on the pool. There's a portion of the pool that is about one inch deep and is equipped with a table and chairs giving you the feeling of sitting above the water. Once of my favorite experiences in Miami Beach. I've created a Foursquare list here to help you remember where to go. Just save it to your foursquare account and all these places will be waiting for you when you get to Miami. I hope this helps you enjoy the city of my birth.